DESCRIPTION: These illustrations are part of my final project at the master programme in Scientific Illustration at the Academy of fine Arts Maastricht, which discusses the vascularised, skeletonised iliac bone flap for oromandibular reconstruction. To compare the bone quantity of the three most common donor sites for oromandibular reconstruction, I chose to combine two different techniques in two series. 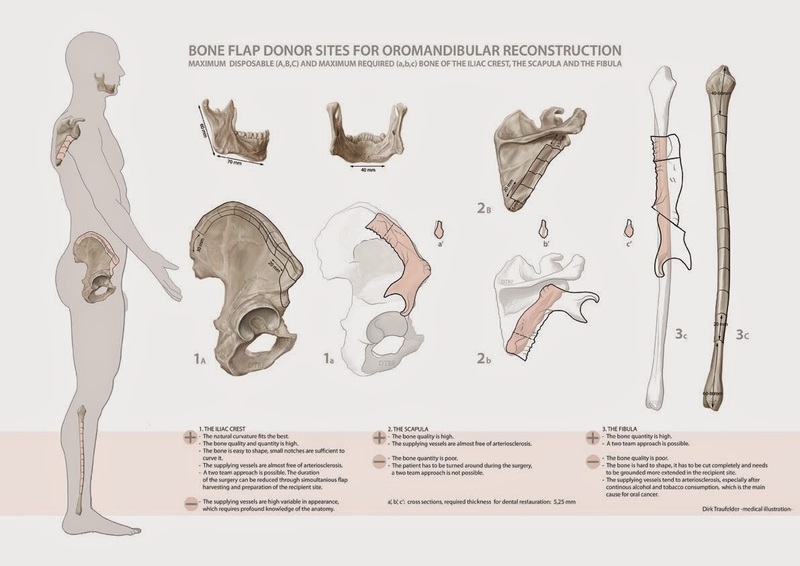 The first series focusses on the maximal available bone quantity of the donor site itself, while the second one concentrates on the maximal required bone quantity by also taking the form of the mandible into account. For the first series I used detailed and realistic drawings to underline the fact that the depicted bone quantity results from the donor sites own accord, their length, hight and thickness. In the second row in contrast, I represented the maximal suitable bone by the tinted intersections of the mandible itself and each donor site using line art to keep the focus on these overlaps.